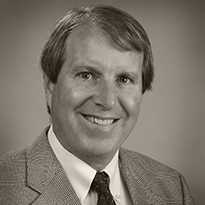 Pat Mandeville, Vice President, came to Rich & Cartmill, Inc. in 1977 as a sales associate. He attended the Aetna Casualty & Surety training school, and received his CPCU designation in 1983. He is a member of the Northeastern Oklahoma Chapter of CPCU and the Independent Insurance Agents of Greater Tulsa and the Oklahoma Association of Insurance Agents. Pat is also a member of the Southeast Tulsa Rotary Club. Pat served on the Oklahoma Association of Independent Agents board. He has also served on the board of the Independent Insurance Agents of Greater Tulsa and the young agent committee of the Oklahoma Association of Insurance Agents. Pat attended Westminster College, Fulton, MO and graduated from the University of Oklahoma with a Bachelor of Science degree in Zoology.